Prosvent – how does it stack up to Best Prostate? We have received a few phone calls regarding Prosvent vs. Best Prostate. 1 soft gel capsule of Prosvent contains 363 mg of a proprietary blend of Saw Palmetto (fruit) Extract, Pumpkin (seed) Oil, Stinging Nettle (Root) Extract, Pygeum Africanum, Lycopene. In addition you will get 100 IU of Vitamin D, 100IU of Vitamin E (as-alpha Tocopheryl Acetate), 5 mg Zinc (as Zinc Sulfate), and 75 mcg of Selenium (as Selenomethione). These are the other ingredients in each capsule: Soybean Oil, Lecithin, Beeswax (yellow), Silica. Prosvent states that you take 2 soft gel capsules per day. Each bottle of Prosvent contains 60 soft gel capsules. Obviously this product must contain some Beta-sitosterol from the Saw Palmetto fruit extract, Pumpkin (seed) Oil and the Stinging Nettle (Root) Extract. How much is the question? There is no actual way to discern the quantity of actual Beta-sitosterol in Prosvent, which is the ingredient that has been well studied and published in double-blind placebo controlled clinical studies. The manufacturer of Prosvent makes the claim that you can try Prosvent risk free for 30 days. You call them and provide a credit card number. If you do not cancel by calling them within the 30 day period your credit card will be charged $79.90 for the 2 bottles of Prosvent that you received. This is in addition to the $9.95 that your credit card was charged the day you called to receive your “risk free” trial of Prosvent. In addition, if you have not called within the initial 30 day period to cancel you will be placed on an auto ship program to receive 2 bottles of Prosvent every 60 days and your credit card will be automatically billed $89.85 every 60 days unless you cancel. If you call Prosvent at 800-778-4584 and do not place an order at the time you call them they will call you back and offer to give you a 25% discount for placing an order over the phone. All orders placed by phone or Internet are subject to the auto ship and automatic billing program. For those of you who have not tried Best Prostate we do NOT subject our customers to either auto shipping product or recurring charges to your credit card. To try Best Prostate the cost for one bottle is $24.95 plus actual shipping costs with no additional handling charges. If you decide that Best Prostate does not work for you simply return it and we refund the $24.95. We do not refund the postage fees. What we do offer our customers is quantity pricing. This means that you can purchase 6 bottles of Best Prostate for $89.70 plus actual shipping costs. This breaks down to a cost of $14.95 for each 30-day supply of Best Prostate. Best Prostate provides the 310 mg of actual Beta-sitosterol per serving for the best price. You simply do not pay for all those unknowns or extras prevalent in other prostate formulas. If you do not mind not knowing the amount of Beta-sitosterol you are purchasing or if price is no object then call Prosvent at 800-778-4584. If you want to try Best Prostate visit http://www.bestprostate.com/ or call 888-768-3836. We have received numerous requests for information regarding the above product as compared to Best Prostate. First Beta-Prostall was re-named Pros-TEROL. The serving size of this product is 3 caplets. Best Prostate is 2 capsules. 1 caplet of Pros-TEROL contains 200 mg of Beta-sitosterol. 1 capsule of Best Prostate contains 310 mg of Beta-sitosterol. Pros-TEROL contains 16 additional vitamins that have not shown statistical significant benefit in multiple clinical studies that establish a benefit with respect to the symptoms of an enlarged prostate. This product appears to be more of a multi-vitamin so if you are one of 53 million Americans who take a multi-vitamin it would be wise to make sure that you are not ingesting supra physiologic levels that may or may not lead to other undesirable situations. Cost of Pros-TEROL is $29.99 each when you order 6 bottles – there phone number is 800-462-9654. Cost of Best Prostate is $14.95 each when you order 6 bottles. Best Prostate can be reached at 888-768-3836 or www.bestprostate.com. This product suggests that you take 3 tablets 2 times daily. 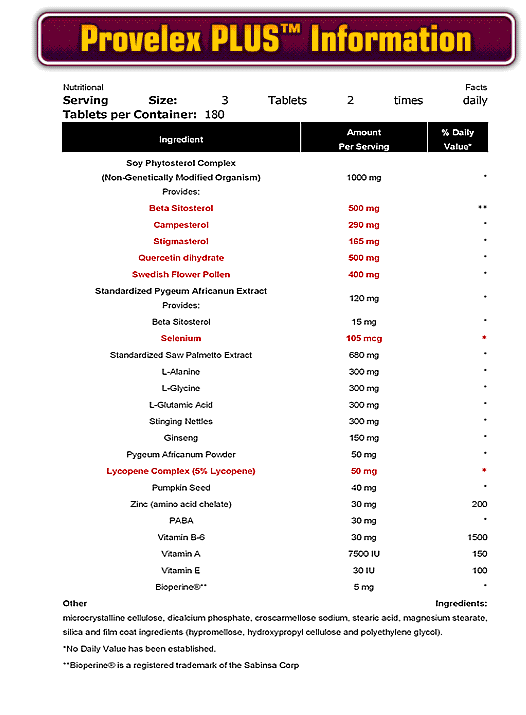 The Supplement Facts can be reviewed by clicking on the image at the right. Being a tablet this product has the following other ingredients: microcrystalline cellulose, dicalcium phosphate, croscarmellose sodium, stearic acid, magnesium stearate, silica and film coat ingredients (hypromellose, hydroxypropyl cellulose and polyethylene glycol). Unlike Best Prostate which has none of these un-necessary ingredients due to the use of an all vegetable capsule. 6 tablets of Provelex Plus provides 500 mg of beta-sitosterol, while 2 capsules of Best Prostate provides 620 mg of beta-sitosterol.